Alcatel-Lucent offers a series of strong service routers that emphasize flexibility and scalability while maintaining high performance levels. 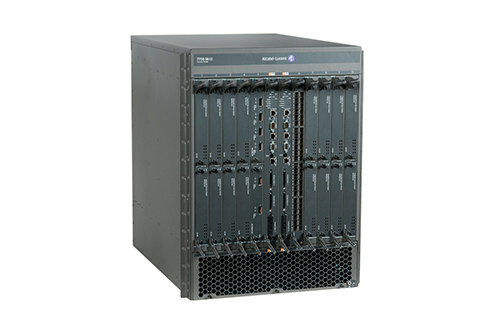 These Alcatel-Lucent 7750 SR-1 and SR-12 models focus on high bandwidth and low latency configurations that you can easily customize for your network, applications and routing needs. Worldwide Supply offers a variety of refurbished Alcatel-Lucent 7750 SR-1 and SR-12 models at a price that won’t harm your growth and still allows you to take advantage of these feature-rich service routers designed for high-usage enterprise and cloud services. The 7500 SR series delivers up to 9.6 Tbps and features up to 36 x 100GbE, 60 x 40GbE or 360 x 10GbE ports with a range of L2 and L3 routing options, traffic management, HQoS and service-aware application support. Insert these into your network wherever you are most in need thanks to IPv4/IPv6, Ethernet, Provider Backbone Bridge, MPLS and MPLS Transport Profile protocol support. With the underlying operating system and platform, the Alcatel-Lucent 7750 SR-1 and SR-12 can inject redundant system hardware support and line card redundancy to keep your network up and running in the event of small outages and emergencies. It would be almost impossible for us to list the HQoS, VPN, L3 routing, security, management and high-availability features of the Alcatel-Lucent 7750 SR-1 and SR-12 on a single page. Browse models below and secure a top refurbished Alcatel-Lucent 7750 SR-1 and SR-12 that brings the quality you demand at a price your network can use to scale and grow.